The Les Paul has been my fave axe for as long as I can remember. Not seeing any falling into my price range anytime soon I’ve been set for a long time on building one. I do find my way through a workshop but I’m by no means a luthier (yeah, I had to look that up) so I thought I’d pick up a kit with all the critical steps already done. 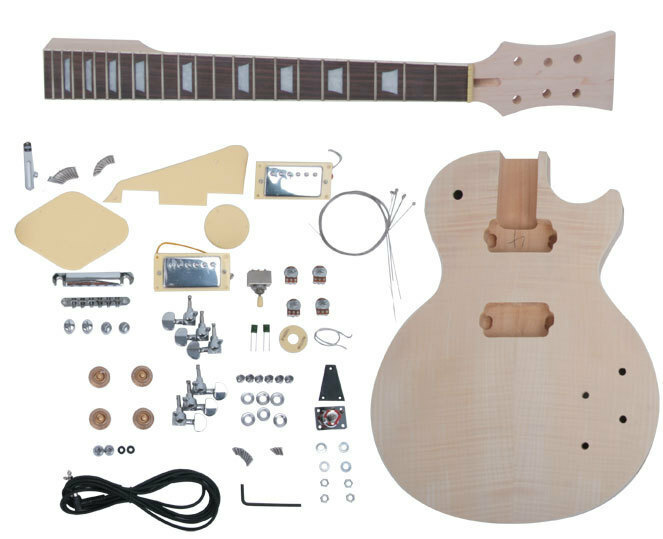 Also since this will be first attempt on “building” a guitar I didn’t want to spend too much cash. I finally settled for a 59 model Les paul style flamed top kit off eBay. It’s a set-neck construction, has a basswood body with a flamed maple top and a hard maple neck with a rosewood fingerboard (628 mm/24.75″, 22 frets). Mechanics, pick-ups etc I’ll have to get to later on. First thing I started thinking about was the paint work of course. Crazy or classic? Crazy will look – just crazy. Classic on the other hand will look awesome, as long as I manage to pull it off. Yes, I’m a complete newb and I will make mistakes. But most of all I will appreciate every little bit of advice I can get on the way.